As stated above, there is definitely going to be a new management plan for Francis E Walter and the Lehigh River in 2005. While we feel this is a great start, this plan is far from what we consider optimal. For a complete overview of the plan we are backing and pushing for - click here. Look for details of the Army Corps plan in the coming days and weeks, as it will become public knowledge. We look at this development as the beginnings of a renewed working relationship between the Army Corps and the stakeholders who utilize the Lehigh on a daily basis. 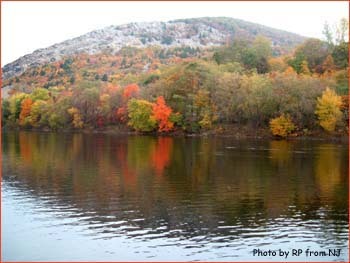 Certainly the potential is there for the Lehigh to become one of the best tailwaters on the east coast - if not the best! Changing gears....It is hard to believe that October is almost over! By this time last year the salt had blown wide open. However, that is far from the case this year - as it has pretty much sucked up until now! The beachfront migration has been pretty much unfishable due to a two-week easterly flow which has wreaked havoc along the beach front. For about a week stretch even the guys that chuck clams could not fish - as the clammers could not even get out. What we need is a good NW flow to finally kick in to knock the surf down, clean it up and get the bait oriented in the right direction. Once that happens you can bet we will be back at it. The fall migration is something you do not want to miss...and hopefully this year we get some killer days in November to make up for what we've missed out on so far. Look for us to maybe be back out on the Lehigh this weekend as warmer temps may have stimulated some movement in the lethargic fish we found last weekend. There is a good chance our Sunday float was our last for the year. Water temps are cold - 46 degrees at Palmerton, and the bug life is sporadic. We did get a few good wraps on our buggers but we did not land anything during our morning float. Scenery was gorgeous, as the trees are almost at peak up that way, but the weather was pretty raw and dreary. Toward the end of the float we came across one bank feeder, but we could not fool him either. It was a tough day on the water. Next up will be the salt - that is if this stubborn NE fetch ever stops. Last year at this time we were slayin fish! What a great time to be on the water! On Saturday we had a group of four out on the Tully. Originally we were to float the Lehigh, but Mother Nature would have nothing to do with that as she deposited a pretty hefty dose of rain up in the Lehigh Gorge area. 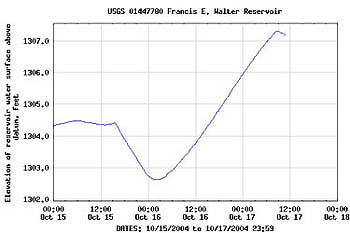 So combine that with an already above normal release pattern from FE Walter Reservoir and we were blown out. That led us to Plan B! And all in all the day turned out great. The group we had out was from all over the US - Tennessee, Wisconsin, Ohio and Arkansas- they were in Philly attending the 17th National Conference for Lawyer Assistance Programs. Sometime ago it was decided they wanted to do some fly fishing while in town. 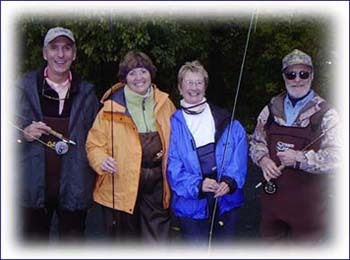 The day started out fast with numerous hook-ups and landed fish by both Gail and Stephen. All the fish landed out of this first run were rainbows...and one was even loaded up with eggs. This is further proof the PFBC stocky bows are genetically engineered to spawn in the fall, just like browns and brookies. None of these fish were huge, but all were beautiful. Shell got a fish on her first cast and Scott, who tried his luck with a spinning rod at the beginning of the day hooked a few, but did not land any. After a quick break for lunch, we relocated to another stretch. It was quickly evident that the action had slowed a bit, but we did manage a few more fish...one of which by Gail was an 18" sucker!! 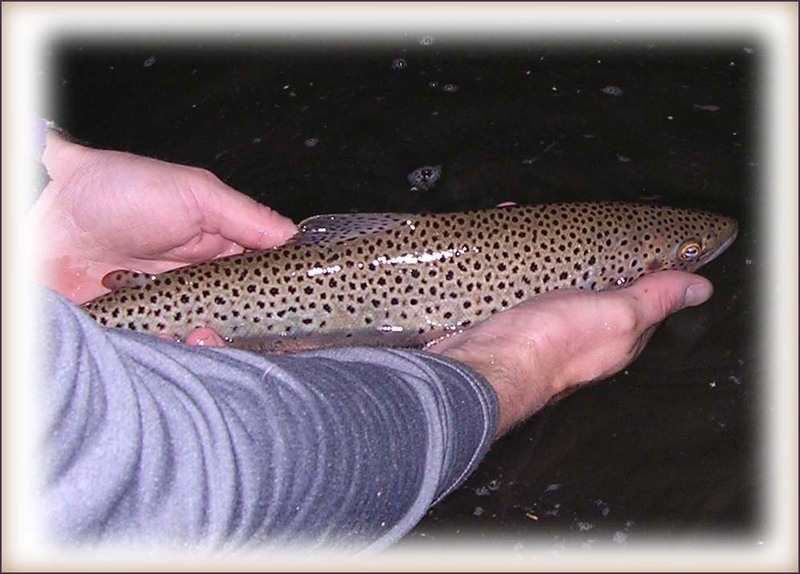 We were hoping for a big brown, with the way it dogged and refused to come up off the bottom, but it was not to be. Stephen rounded out the day with another brown and smaller rainbow, with parr marks and we even got the fly rod into Scott's hand by the end of the day. Not sure if we converted him, but we tried. Maybe next time we will have throwin the whole time? Steven with a nicely colored-up Tully rainbow. up in sudden, tropical-like downpour style. This illustrates how all the tribs that feed the LR down in the gorge faired. Add to this the tribs below the gorge and you've got blownout conditions. Overall it was a great outing with a fantastic group...there were lots of laughs, no one fell in and we were able to show them just what fly fishing in PA is all about. We hope to host them again if their travels bring them to PA again. Effective patterns for us were caddis pupas - both with and without beads, caddis worms, nitros and even the good 'ole san juan worm. All flies were sizes 14-18 - mostly tied on scud style hooks. Adding some split shot was key, since the fish seemed to be holding deep. When we first arrived there were swarms of tricos, but you can forget about that as the fish were in no mood to look up. Even the bouncing caddis that were quite plentiful could not bring up the fish in any sort of consistency. You would not be maxing out on your time if you threw dries. take that you dry fly fishing elistest snobs!!!! that means you TLA!! Yesterady, early on the trout were on the feed, looking for caddis worms/pupas/emergers. Once the mid-day hours rolled around hook-ups became tough. Go with caddis pupas, caddis emergers, and nitros. Our group did very well despite the highwater, rainy/blustery conditions. Look for more a detailed report later. Dean put in a half-day float on Saturday with two fishing buddies - Karl and Bob. Beautiful fall day, leaves are about 30% full-glory and water levels at a nice level for floating - 1400cfs at the Lehighton gauge. Water temp was 55.
and by the way, if you walk the banks of the river, check the trees. Bob so nicely decided to do some decorating with about a dozen buggers. Way to go guys - Great time on the river as always!! 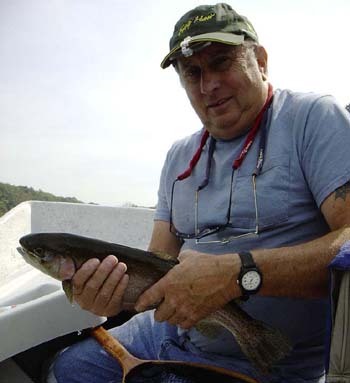 Karl hoisting a hefty Lehigh River rainbow. It is hard to believe, but the '04 season is coming to a quick end. This week much of the state will see its first frost, and many of the more rural locations will have a killing freeze. This pattern looks to be short-lived though, with Indian-Summer type weather coming toward weeks end. We are still experiencing run-off as a result of the tropical rains, even on the smallest of waters. If you are able to get out - bug life might on the slow side, but be on the lookout for some olives, caddis and maybe even a few Isos. Streamers and subsurface flies are probably your best bet. Of course we always have the saltwater, salmon and steelies to keep us busy. However, as of late the saltwater action has been non-existent. Weather and water conditions have tough. 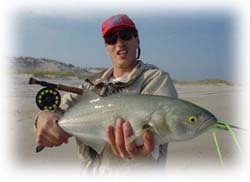 We've seen lots of bait - mostly mullet along the beachfront, but there have not been any predators of size on it - only smaller bluefish up to 20". Usually mid-October is when it busts wide open. Next run of baitfish to start pouring out of the back bays will be the bunker. If anyone is looking for some input on this fantastic fishery - shoot us an email. Check out some of our action from last year. 8-10 weight rods, matched-up with either an intermediate or a sinking 200-400 grain line. The sinking lines enable you to get down in the current or deepest of holes. A good quality reel with decent drag is also a must. 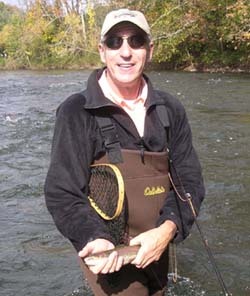 Saltwater fly fishing does not require near the precision that freshwater trout fishing - so keep that in mind. But your need to be able to throw line effectively. Flies are all the usual suspects - clousers, deceivers and Popovics Jiggies. Go with chartreause, white, olive, yellow and combinations of all. And don't forget the stripping basket - either make one yourself or buy a pre-fab.